Garmin's GT52HW-TM Transducer provides depth and temperature readings. Perfect for Freshwater fishing or shallow saltwater fishing the GT52HW includes CHIRP Traditional Sonar and CHIRP ClearVu and CHIRP SideVu for near photolike images below and to the left and right of your boat while consistently displaying crisp clear fish arches and enhanced target separation. Garmin's GT52HW-TM Transducer offers an 12-pin configuration and provides crisp clear images of structure and fish below and to the sides of the boat. The GT52 High Wide Transducer offers CHIRP High frequency traditional sonar (150-240kHz) with a 250W power rating and CHIRP ClearVu and CHIRP SideVu (455/800Khz) and has a power rating of 350W per elements. 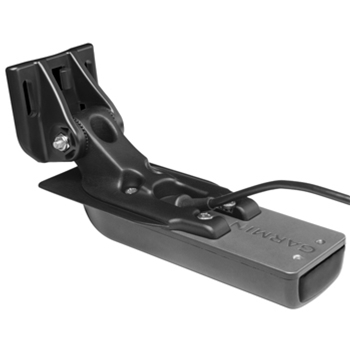 Includes GT52HW-TM Transducer, Transom Mount, Trolling Motor Mount, Mounting Hardware and Installation Guidelines. Compatible with Garmin GPSMAP 7600 Series, echoMAP CHIRP sv models, echoMAP PLUS SV Models and GSD25.